Images: All images copyrighted 'Devon County Council' are sourced from the Westcountry Studies Library. Permission to reproduce any of these images should be obtained from the Westcountry Studies Library. However, Devon County Council is not the copyright holder for certain images held at the Westcountry Studies Library and queries regarding the copyright status of images held by the library should be directed towards the Westcountry Studies Library itself. After the Cathedral and the Guildhall, this is probably the single most-photographed building in the entire city, despite the fact that its unusual gable is a late-19th century invention. Still, it remains an important Grade I listed building and the finest of its type still left in the city. A few local legends have attached themselves to the building, nearly all of them either untrue or unlikely. For example, No. 1 Cathedral Close has been called the first coffee house in England, opened by an Italian called Thomas Mol. The oak-panelled room on the first-floor is often cited as being the place where Sir Francis Drake regularly met with other Elizabethan sea captains, such as Richard Grenville, Martin Frobisher, John Hawkins and Sir Walter Ralegh (usually discussing the Spanish Armada...). There's no limit to people's imaginations. The Italian named Mol is mentioned by Jenkins in his mammoth history of Exeter first published in 1806. Jenkins seems convinced. The building actually was used as a coffee house for much of the 18th century but it's more likely that it was named after Mary Wildy, who took out a lease on the property in June 1726 ('Mol' being a diminutive form of 'Mary'). The first coffee house in England is supposed to be in Oxford, the Grand Cafe, opened in 1650 and mentioned by Pepys in his famous diary. As for Drake & Co., unfortunately Drake was dying off the coast of Panama in 1596, the year in which the current property on the site was being built. According to Todd Gray in his book 'Exeter Unveiled', there's not even any evidence that Drake even visited the city. John Hawkins was dead by 1595, Frobisher died at Plymouth in 1594 and Grenville was killed in battle with the Spanish in 1591 at the Battle of Flores. Sir Walter Ralegh was born locally, at Hayes Barton in East Budleigh, but it seems far-fetched to believe that they all ever met at the house itself. And the 1588 Armada was already old news when the house was built. Given its prominent location near the High Street and the Cathedral, and near the corner of two Saxon streets, it's likely that there has been some sort of building on the site for over 1000 years. Some of the first documentary evidence for a structure here dates to 1410, when Bishop Stafford granted the Cathedral's chantry priests (known in Exeter as the Annuellars) this corner the Cathedral Close to use as a residence. Known as the Annuellars' College, this large complex of medieval buildings would, by the 16th century, have spread across into what are now Nos. 1 to 5 Cathedral Close, although it didn't include the Canonry on Catherine Street, as is widely believed. The College was disbanded during the Reformation of the 1530s and the building on the site of No. 1 fell into private ownership. 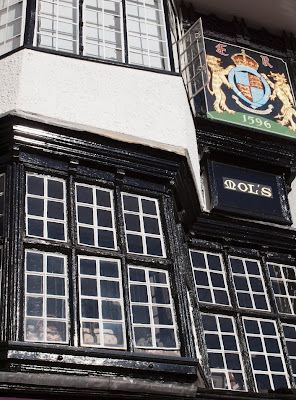 In 1596 the building was totally remodelled, probably by John Dyer, a wealthy Exeter yeoman. The late-16th century remodelling included a completely new facade and interior. The Elizabethan house might've had twin gables originally and was spread over four floors. Before the ground floor was converted into a shop in the 19th century three tiers of projecting windows rose from the ground floor to the third floor. The surviving oriel windows of the first floor are particularly noteworthy as the window lights run across the entire facade of the building. Behind these first-floor windows lies one of the finest 16th century panelled rooms in Exeter, inappropriately called the 'Armada Room' in some guidebooks. The panelling is made of oak, the small rectangles divided by elaborate fluted carved pilasters. Inset into the frieze around the top of the panelling are 46 shields painted with the coats of arms of various Devonshire families, mostly from the 16th century, including the arms of Drake himself. These coats of arms are almost certainly a latter addition from the 19th century, perhaps the work of artist John Gendall who lived in the house during the 1800s. But the quality of the late-16th century carving is absolutely superb. 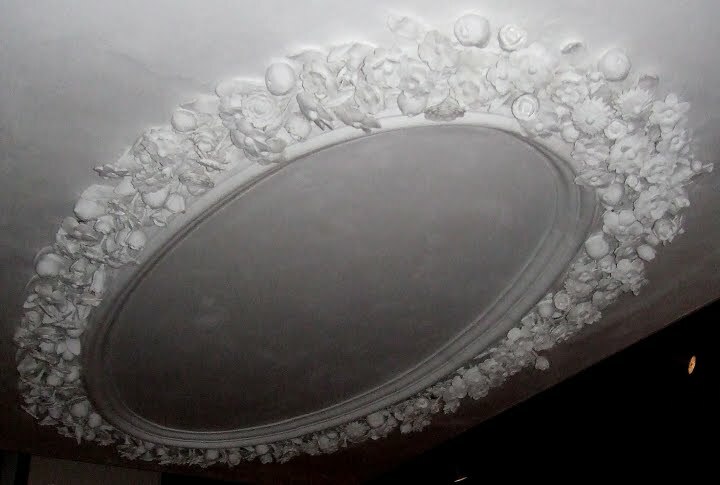 The room also features a geometric single-rib decorative plasterwork ceiling from the same period. Unfortunately the first floor is not open to the public. In 1596 the ground floor was leased by Thomas Dyer for use as the city's Custom House. Jenkins, writing in 1806, states that until "very lately there was a pediment over the doorway, on which was carved the arms of Queen Elizabeth, with the initial E.R and the date 1596". This coat of arms disappeared but was replaced with another above left, painted not carved, in 1885. In 1800 the house looked significantly different right. There is no sign of the Dutch-style curly gabled parapet which is such a distinctive feature of the house today. When I was at school we were told that the reason for the distinctive gable was because it made the house look like the rear of an Elizabethan galleon so Drake, etc. would feel at home! In fact the Dutch gable wasn't added until the late-19th century when the house belonged to postcard seller, Thomas Worth, the author of many of the fanciful takes concerning the property. To the far left can just be seen the entrance into Catherine Street and the start of the row of timber-framed houses which were demolished in the early-20th century. Despite the changes that have taken place the building remains one of the finest surviving pieces of historic architecture in Exeter and is now one of the most instantly recognisable places in southwest England. Its setting within the Cathedral Close is exceptionally picturesque. Almost everything lying to the immediate rear of the property was damaged either by bombs in 1942 or demolished as part of the post-war reconstruction. It is incredible that the house survived at all, given how close it came to complete destruction. 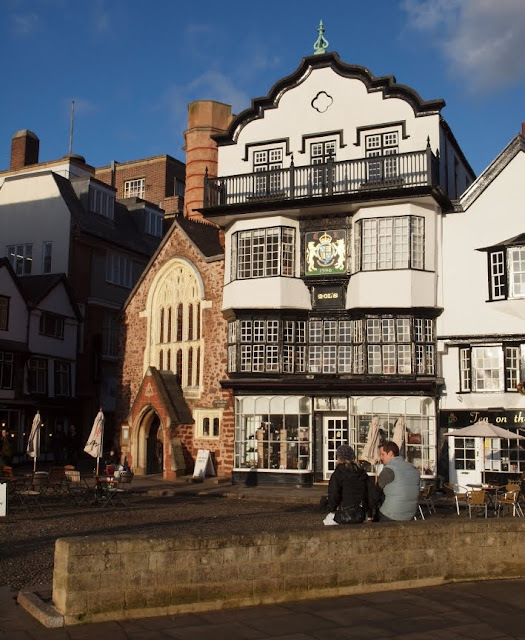 It was parts of Exeter such as this which made the city a cultural target during World War Two. Fortunately, here at least, the bombs missed. Catherine Street has been almost completely destroyed, disfigured, replaced and truncated over the last 100 years, despite having survived in some form since the 9th century. Today it is little more than a short passageway at the end of a post-war square. And yet, like Paul Street and much of the West Quarter, just over 100 years ago it was lined with a number of timber-framed houses from the 15th, 16th and 17th centuries left as well as having a complex of 15th century almshouses and significant fragments of a 13th century canonry. It is a perfect example of how a historic street can be totally ruined by demolition, war and insipid reconstruction. 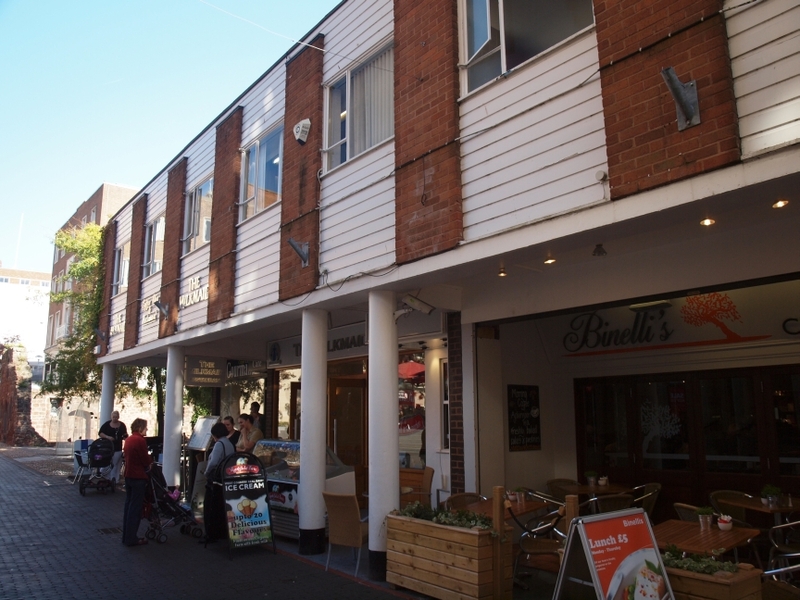 Catherine Street was one of a number of Exeter's streets that was first laid out under Alfred the Great at the end of the 9th century. The city had been besieged by the Danes in 876AD and 893AD, sieges that the Anglo-Saxon king had successfully managed to break. 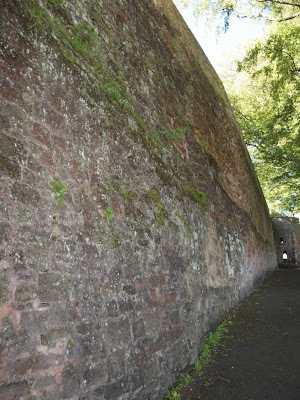 In response, the important Saxon stronghold of Exeter was refortified, its Roman city wall repaired and strengthened, and some of the city was divided into small tenements, or burgage plots i.e thin strips of land with narrow street frontages upon which a house could be built, with a long garden or yard at the back. Catherine Street was probably created as a lane off the High Street to give access to these tenements. The image right shows the facade of a half-timbered house on Catherine Street c1850. 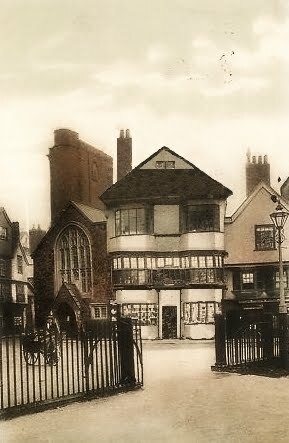 Combined with the photograph at the top of this post, taken c1900, it shows how much of the street's medieval character survived intact into the 19th and 20th centuries. Like many other ancient streets in Exeter, Catherine Street has undergone several changes of name. According to the 19th century historian, George Oliver, a small section leading from the corner of St Martin's Lane to the almshouses was sometimes called Paternoster Lane. A deed of 1280 refers to the street as Doddehaye-strete and describes it as lane as leading from St Martin's church to the Domincan Friary. 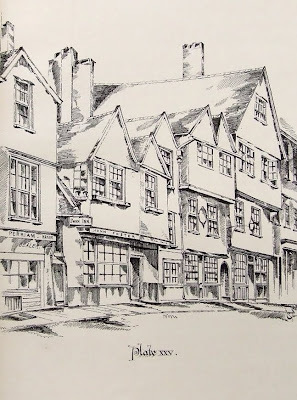 It was known as Doddehay Street until the mid-15th century when it gradually took on the name of the almshouses dedicated to St Catherine which stood in the street from 1458 until they were gutted by fire in 1942. Hoskins suggested that 'Doddehay' was perhaps derived from an Anglo-Saxon landowner named Dodda. (The suffix 'Hay' is commonly found in Exeter e.g. Trichay Street, Southernhay, Northernhay, Kalendarhay, Friernhay, etc. and itself derives from the Saxon word 'hege' meaning an 'enclosure' and from which we get the modern word 'hedge'). 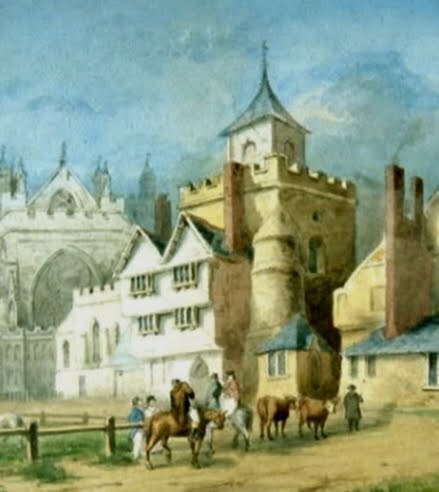 Catherine Street (shown left c1886 in a drawing by James Crocker) was also once the site of one of the gates set into a security wall which encircled the cathedral precinct following the murder of the precentor Walter Lechlade in 1283. 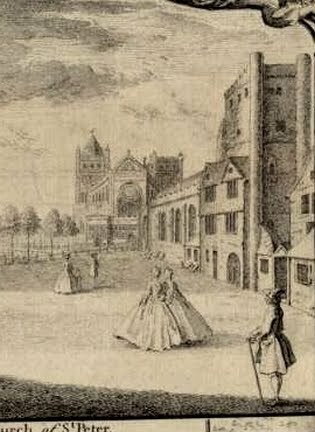 The gate later became known as St Catherine's Gate because of its close proximity to the above-mentioned almshouses. The gate predated the almshouses by over 130 years. Prior to the construction of the almshouses it was known as Bickly Gate or Ercenesk Gate, named after Reginald de Erceneske, a canon who probably lived in the canonry on Catherine Street, part of which would eventually become the Country House inn (also destroyed in 1942). 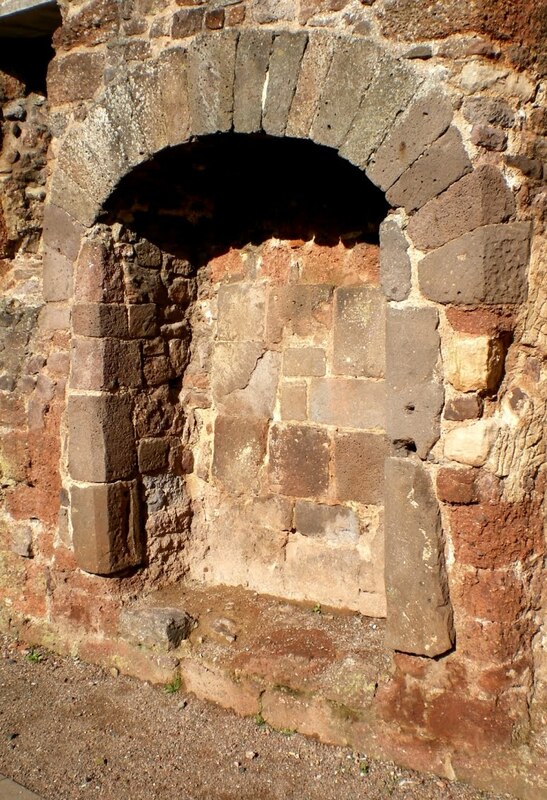 St Catherine's Gate was approximately 8ft wide, big enough to accept a pack horse laden with panniers. A lease for the Country House inn in 1814 contains a covenant to "give up the chamber over the gate" so at some point it had accommodation above it. St Catherine's Gate projected out from the front of the inn near a large stone arch, formerly a doorway, but altered into a window of the inn. 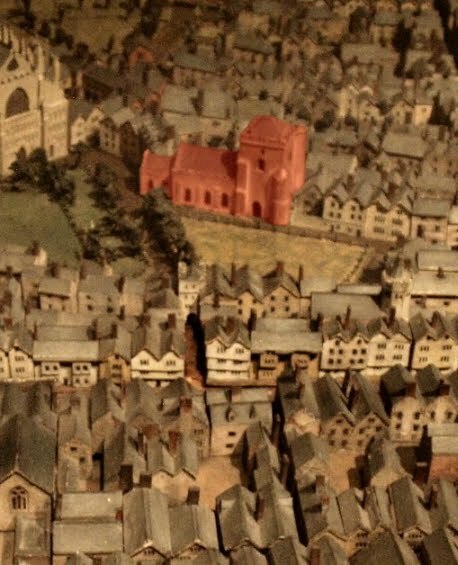 Hedgeland's wooden model of Exeter in 1769 shows both Catherine Street and St Catherine's Gate. The gate was demolished c1814. Until 1942 the location of the gate was marked by an iron ring set into the wall of a house opposite the Country House inn. The metal ring was reset into a low wall during the post-war reconstruction but the recent redevelopment of the area has seen the ring disappear. Now there is no visible reminder that the gate ever existed. The image right shows Catherine Street in 1905 overlaid onto an aerial view of the same area today. 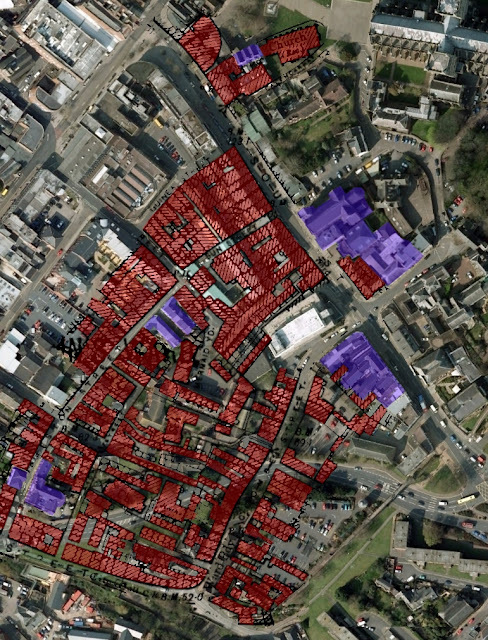 All of the buildings highlighted in red have been demolished since 1900, either through pre-war clearances or during the Blitz of 1942. Only those highlighted in purple still remain today. Much of the old street at its north-eastern end now lies under great swathes of post-war redevelopment. Starting at St Martin's Lane, a walk through Catherine Street in 1900 would've taken in many timber-framed houses, with the ancient Swan Inn on the left, the medieval remains of the Canonry and the 15th century Almshouses on the right. There was a small crossroads where you could either go into Stephen Street, under the old bow of St Stephen's church and into the High Street or into Egypt Lane, along the backs of the townhouses in Bedford Circus and out into Southernhay. A little further on Catherine Street crossed Bedford Street, passing to the rear of the late-17th century Half Moon Inn, crossing the entrance into the Georgian housing scheme of Bedford Circus before reaching the corner of Bampfylde Street, upon which was the magnificent late-Tudor mansion known as Bampfylde House. In terms of varied historical architecture and sheer picturesque interest, streets in English cathedral cities simply did not get much better than this. It is difficult to imagine now how narrow all these old streets and lanes were at the end of the 19th century, how they twisted and turned and led you into unexpected corners of the city, many of them still possessing remarkable old buildings which had changed little for centuries. And then, as has happened so often in Exeter, it all went hideously wrong. In the first decade of the 20th century, and long before the destructive bombing of 1942, most of the timber-framed buildings which existed on the street in 1900 were demolished. 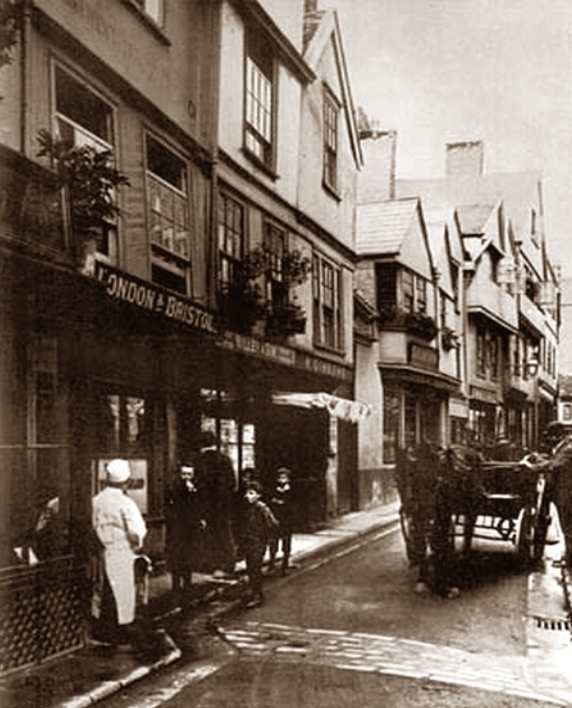 Of the ancient houses shown in the photograph at the top of this page, only the one to the far left of the image, dating to c1450 and with the sign "London and Bristol" over the entrance, survives today as No. 2 Catherine Street. (No. 1 Catherine Street still survives and is of a similar age). By 1928 much of the street had already been rebuilt. On 4 May 1942, the area surrounding Catherine Street was heavily damaged during the Exeter Blitz left © Express & Echo. It's difficult to know exactly what was lost, but the 15th century almshouses were gutted as was the site of the 13th century canonry, then known as the Country House inn. Even if the timber-framed houses had survived then they probably would've burned to the ground anyway. The ruins of the almshouses and the canonry suffered further demolition in the post-war clear-up but at least they were retained as a reminder of the devastating air-raid. 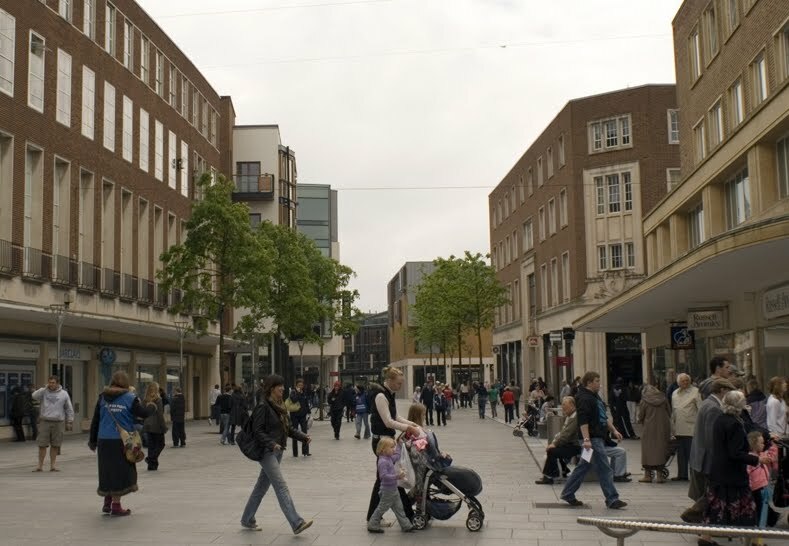 Despite the fact that the line of the street dated back to the 9th century, during the post-war reconstruction of the 1950s half of the street was turned into a no-through service road to supply the new shops which fronted onto the High Street and Princesshay. A small public square was constructed opposite the ruins of the almshouses and, at least in terms of the number of buildings which now front onto it, the street has almost ceased to exist. As if that wasn't bad enough, the small amount late-1950s architecture which was built on the remains of the street is of quite exceptionally poor quality above. It's difficult to disagree with Gavin Stamp's assessment that the general post-war rebuilding of Exeter, led by the city's surveyor John Brierley, was "largely inappropriate, incoherent and dismal". Either way, this was one of the few post-war shop frontages which was built on the original 9th century line of Catherine Street. The post-war decision not to respect the Roman, Saxon and Medieval street plan in Exeter did more fundamental damage to the historic roots of Exeter than even the German bombers managed to accomplish. And it happened across the city: Bampfylde Street, Chapel Street, Musgrave Row, George Street and Sun Street, to name just a few, were all wiped off the map in the post-war reconstruction. The alignments of Southernhay and Paris Street were totally altered and South Street and the upper High Street were drastically widened. And this is before the other depredations inflicted on the city in the 1950s, 1960s and 1970s are taken into account. Today almost nothing remains of the street as it appeared in 1900, except for the aforementioned ruins, the two 15th century timber-framed houses and a brick building called Oddfellows Hall built c1900. In his book "Aspects of Exeter", Peter Thomas refers to post-war Catherine Street as "pleasingly narrow" but for me there is very little that is either pleasing or narrow about the street now, especially in comparison with what it once was. Its one redeeming feature is the fact that it is pedestrianised, saving the street from the bus fumes which pollute the nearby High Street. Drag the slider on the image below to switch between images of Catherine Street in 1900 and Catherine Street in 2012 or click on 'Show only then' or 'Show only now'. 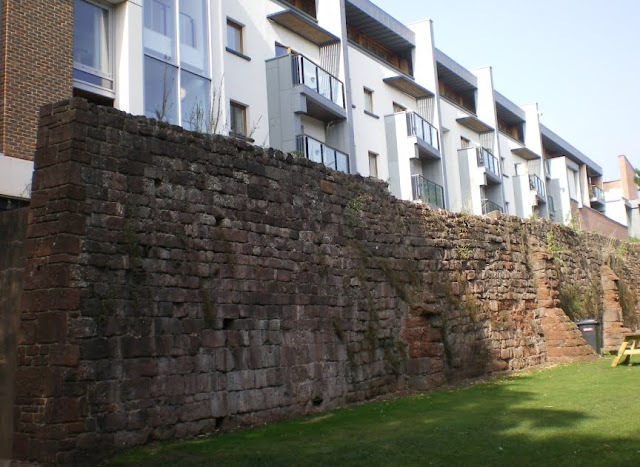 It has withstood sieges and assaults, bombings and demolition, and you can easily miss it, but buried behind Exeter's 20th century redevelopment is one of the most complete, well-preserved circuits of defensive city wall in England. 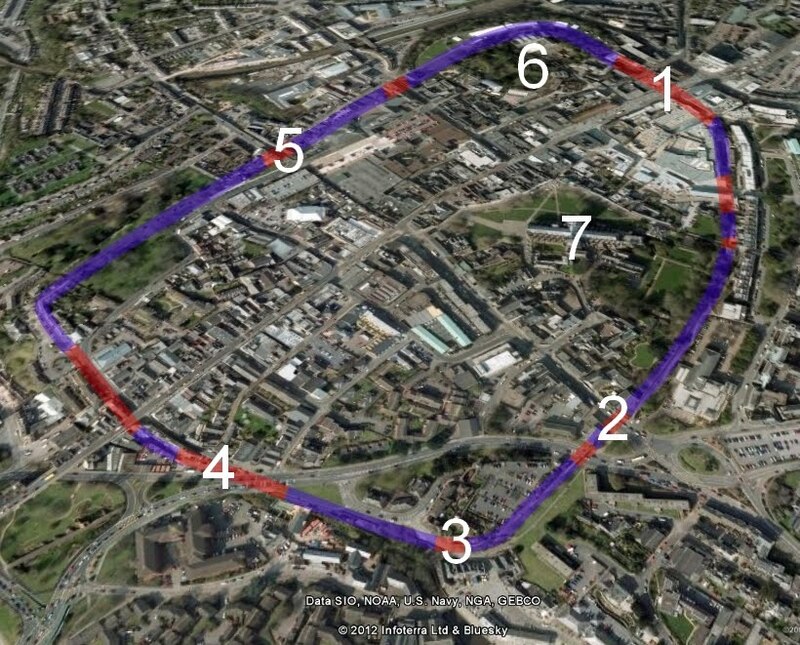 About 72% of the circuit survives and both its layout and much of its fabric is nearly two thousand years old. It is Exeter's largest single structure, a Scheduled Ancient Monument and, considering that nearly everything encompassed by the wall has been redeveloped over the last century, it is nothing short of incredible that so much of it has survived in such good condition. Its history is detailed and complex and there are so many interesting features that this post will just be an overview of the structure. The 1st century Roman fortress of the Second Augustan Legion originally occupied a 42 acre site on top of a promontory of land which projected out from the surrounding hills towards the marshes of the River Exe. This relatively small area developed over the course of the next 100 years to become a civilian settlement until, in c180AD, the boundaries of the Roman town were dramatically expanded outwards to encompass 93 acres. A huge defensive wall was built using stone quarried from the extinct volcano at Rougemont in the north-eastern corner of the newly-enlarged city. The shape of the Roman city was a distinctive rectangle, dictated by the topography of the landscape itself as the settlement spread over the top of the promontory, bounded to the north and west by deep ravines and high cliffs. Almost everything that Exeter is and was happened within the walled area. It was this area in which the Romans lived, in which the Saxons settled, that the Danes destroyed, which Alfred the Great liberated, that William the Conqueror laid siege to, which was attacked by Perkin Warbeck in the 16th century, which was besieged (twice) during the English Civil War, which was bombed during World War Two; this area was the location of the three great institutions of medieval life: the castle, the cathedral and the guildhall; and this area was the economic, social and political heart of the city for 2000 years; a major Roman outpost, a great Anglo-Saxon town, a major medieval city, a Tudor and Stuart powerhouse of wealth, a Georgian metropolis, and the county capital of Devonshire. Accompanying the vast stretches of stone walling were city gates, first built by the Romans and then rebuilt in the late-Middle Ages: South Gate (its medieval incarnation regarded as one of the most imposing gateways in England), East Gate (a model of which is shown above right), West Gate, North Gate and Water Gate. None of these gateways survive today. An inner ring of defensive walling was erected around the Cathedral Precinct in the late-13th century, creating a walled city in miniature. The Romans built the city wall using purple volcanic trap, an exceptionally durable type of stone, much of it quarried from the remains of the extinct volcano at Rougemont. It was up to 10ft (3m) thick and 25ft (6m) high. Its huge scale, running for approximately 1.5 miles (2.3 kilometres), was intended to function as a defence against any angry Celts who happened to be in the area as well as acting as a demonstration of sheer power. Some large stretches of Roman masonry from the late-2nd century survive today. The photograph above shows an exterior section of the city wall near the modern inner bypass. The purple-grey volcanic trap in the upper two-thirds is original Roman facework from the 2nd century civitas of Isca Dumnoniorum (i.e. Exeter). The lower third is where the ground level has eroded and the wall has been underpinned, probably during the Middle Ages, using a different type of stone. The photograph right shows the seemingly impregnable the wall at Northernhay looking towards John's Tower in the distance. The precinct of Rougemont Castle is on the other side of the wall. The city wall was strengthened and repaired by the Anglo-Saxons, probably in c920AD during the reign of King Athelstan, grandson of Alfred the Great. Athelstan is believed to have ordered the wall to be extensively overhauled. Some elements of the late Saxon masonry can still be seen at the wall in Northernhay gardens. 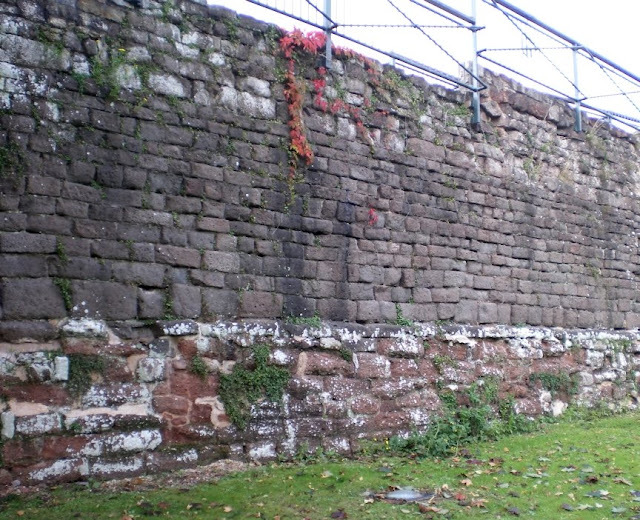 The wall was repaired, improved and refaced throughout the medieval period. Ten towers were added in the 13th century. Five were added between the East Gate and South Gate, the section of wall most exposed to attack. A further four were built around the castle at Rougemont and a solitary tower, later known as the Snail Tower, was constructed in the western corner of the city. Significant repairs were undertaken in the 16th century, including a widespread overhaul between 1539 and 1540 which used stone recycled from the recently dissolved Priory of St Nicholas. Unlike the other gates into the city, which were probably constructed on the site of their Roman counterparts, the Water Gate only appears to date to the 1560s. By the time of the English Civil War in the mid-17th century the city wall was in need of yet further repair and gun batteries were placed along the southern and eastern sections of the wall, some of which still remain. 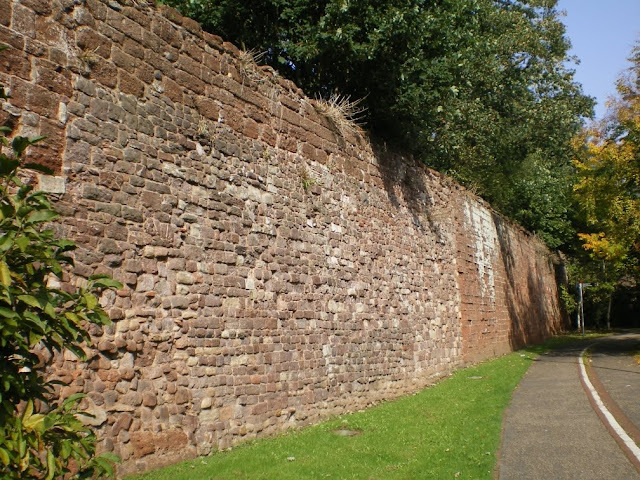 During the two sieges of Exeter in 1643 and 1646 the city wall formed one component of a defensive system which included not only the gun batteries but a complex series of ditches and ramparts; but that was the last time the wall would be called upon to defend Exeter from attack. Throughout the 18th and 19th centuries the wall sank into the background. Houses were built up against it and as the suburbs swelled the importance of the city wall as a defensive structure was lost. Apparently it never occurred to anyone to destroy it completely. The photograph above shows part of the external face of the wall at Southernhay. This section was badly damaged during the English Civil War but was subsequently rebuilt. Behind it are the grounds of the Bishop's Palace. It's no surprise that the greatest damage to the surviving circuit happened during the 20th century. 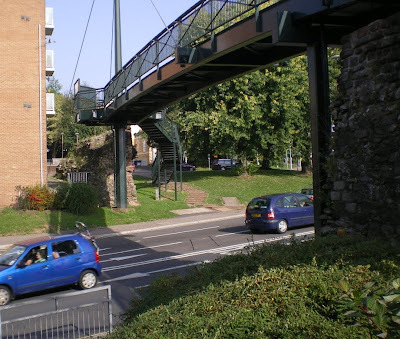 One particularly lengthy section near the site of the East Gate was demolished in the post-war rebuilding of Exeter following the Blitz of May 1942, and more was hacked apart with pick axes in the 1960s to build the inner bypass. The photograph right shows how the Yaroslavl footbridge spans a large breach in the wall which had remained intact until its demolition in 1961 as part of the inner bypass road scheme. A significant stretch of surviving Roman facework was buried in the 1970s behind Broadwalk House in Southernhay. However the surviving sections are now relatively well maintained and respected. The photograph below shows the exterior of the wall as it runs along the edge of the recently redeveloped Princesshay shopping precinct. The buttresses visible to the far right are late-medieval additions. The finely dressed stone facework to the left is Roman. The rather unattractive buildings behind are 21st century. Until 1942 the gardens of the now destroyed top two Georgian terraces in Southernhay West backed onto the wall at this point. The wall is still incredibly impressive, although unfortunately little is made of it. It is not possible to walk on top of the wall in Exeter as you can in other walled cities in England and the old city doesn't crowd around it like it used to. 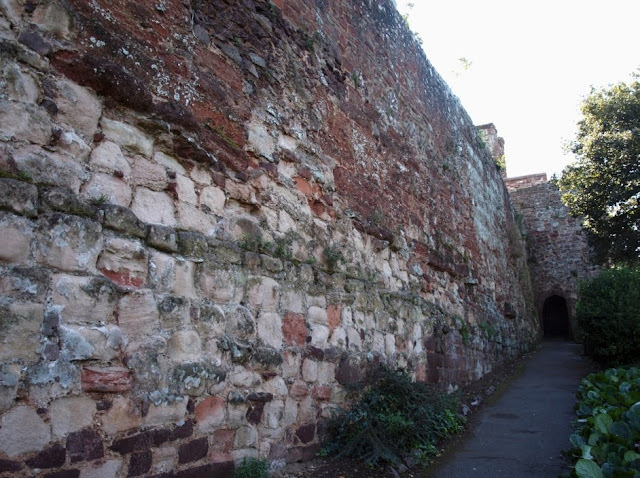 Compared with the walls of Chester and York it is almost ignored but properly managed they could be a major feature of Exeter's tourist industry. 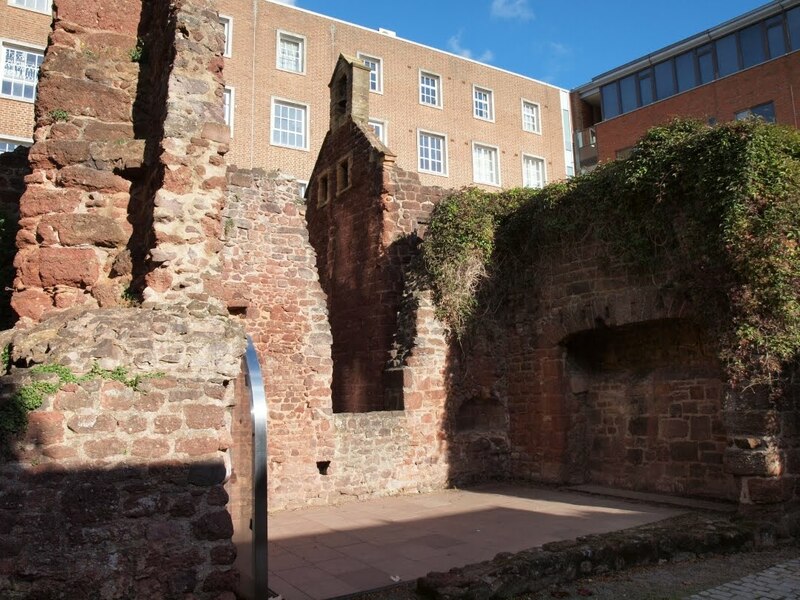 Guided tours are available for anyone interested in Exeter's history rather than just its shops, and a walk around the wall takes you through some of Exeter's few remaining attractive areas. In Catherine Street today are a jumble of semi-incoherent ruins, the medieval fragments of buildings which were largely destroyed during World War Two. One of these buildings was a complex of almshouses with a chapel dedicated to St Catherine. The other was a canonry, a house built for one of the Cathedral's 24 canons. The canonry dated from the 13th century and predated the almshouses by over 150 years. It appears to have consisted of a sequence of rooms probably built as a residence for Canon Reginald le Ercesnek (Canon Ercesnek was found guilty of harbouring a felon after the murder of Precentor Walter de Lechlade in 1283). It comprised a gatehouse entered via Catherine Street, a front range on Catherine Street itself, with a large hall, service rooms, chambers, malthouse and stables to the side and rear. The area closest to the site of the almshouses was used as a service block, with a pantry, buttery and a large kitchen. Three doors inset into a thick wall led from these rooms into the hall, a typical configuration found in many similar medieval buildings. The only part of these buildings still standing are the ruined remains of the kitchen. The kitchen itself was probably substantially rebuilt in the 15th century. It is widely believed that the canon's house had been subsumed into the Annuellars' College by the beginning of the 16th century. The very extensive remnants of the canonry appear as the 'College of Chantry Priests' on the Ordnance Survey map of 1876. However recent research has shown that this was not the case and the Annuellars' College (occupying the site of Nos. 1 to 5 Cathedral Close) and the canon's house on Catherine Street remained two distinct and separate buildings. According to Parker & Collings, the canonry was the residence of the Cary family in the 16th century although in around 1700 the property was subdivided into different tenements. The early 19th century historian, Alexander Jenkins was under the impression that the site of the almshouses and canonry was once part of a Benedictine nunnery. This is certainly incorrect, but he does state that there was "a great part of this ancient structure remaining". By the time Jenkins wrote his history one of the tenements carved out of the canonry was an inn called the Country House at No. 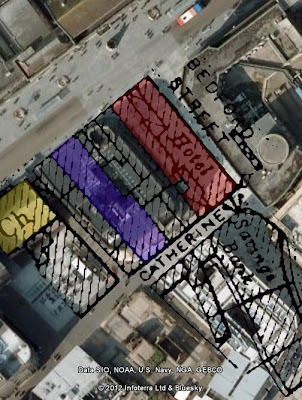 37 Catherine Street (highlighted in red on the image right). It appears that the parts of the upper floor have been rebuilt in brick during the 18th or 19th centuries, perhaps a replacement for a timber-framed upper storey such as can still be seen at No. 9 Cathedral Close. 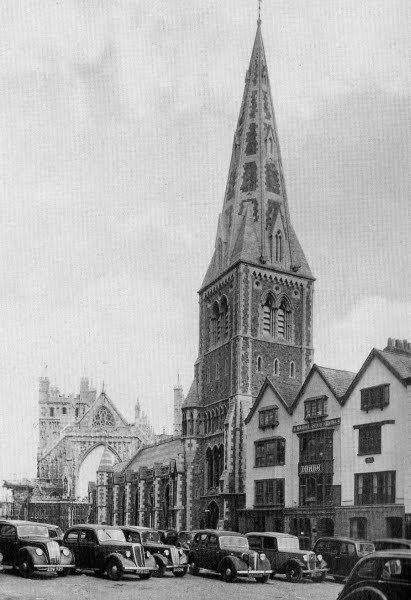 In his 1821 'History of Exeter', George Oliver notes that "a beautiful arch, now closed up and disfigured by the window of an ale house is still to be seen near St Catherine Gate". The ale house mentioned is certainly the Country House inn, the arch was part of the canonry building and probably formed the main entrance into the residence. In 1855 an article appeared in a Trewman's 'Exeter Flying Post' which gives some clues as to what parts of the medieval building still existed. According to the article's author, the Country House inn's malthouse was formerly a chapel and still contained "a very good open timber roof" that was "in the style of the 15th century". A passageway led from the front of the inn to a courtyard at the back. Within the wall of the passage were five blocked-up Gothic windows of different types, with several other Gothic windows existing within the malthouse itself. Apparently similar arches existed "in the kitchen, and also in the bed chambers and the passages above stairs." Exactly how much of the medieval canonry existed on the site prior to World War Two is uncertain. The kitchen certainly survived as part of the Country House inn and it's more than likely that other substantial medieval elements existed within both the fabric of the tavern, as mentioned above, as well as other buildings which fronted Catherine Street. The 1876 Ordnance Survey map of Exeter suggests that several properties on Catherine Street included significant medieval walls behind rebuilt frontages. Some of the buildings at the rear were demolished at the end of the 19th century and more demolitions followed in the 1920s, although Parker and Collings state that "despite these losses, the service wings of the house survived remarkably complete until the air-raids and post-war demolitions." 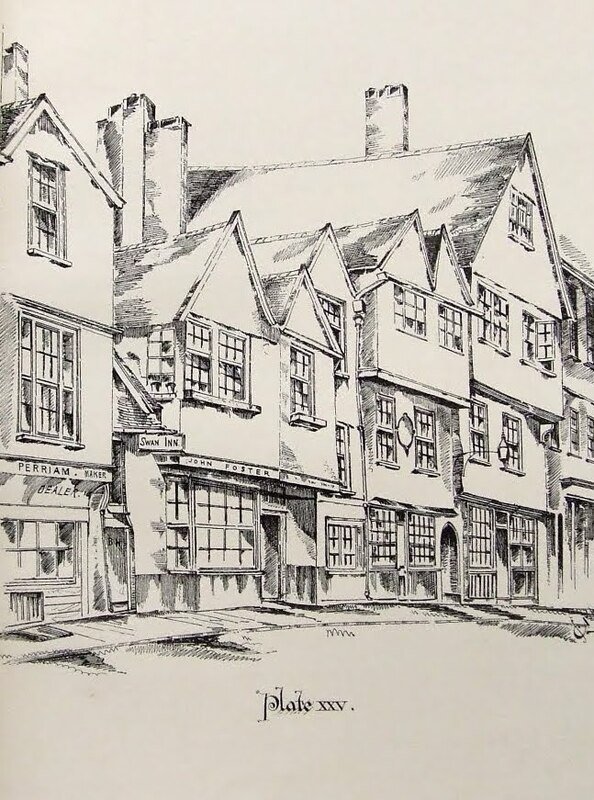 Ethel Lega-Weekes reported in her fascinating 1915 book 'Studies in the Topography of the Cathedral Close' that in 1912 she had visited a "long, low apartment" situated behind Nos. 38-41 Catherine Street (i.e. running from the current ruins nearly to the corner of the street at St Martin's church). One of the walls of this apartment was demolished soon after Lega-Weekes's visit but she recalled seeing two medieval arched doorways embedded in it. Another wall contained three small doorways, which she believed to date from the 14th century, and two large blocked doorways. One of the small doorways still "communicated with what are now narrow cellars or store-rooms used by the publican". These three doors would've lead into the large hall. Unfortunately I am unaware of any existing photographs which show either the interior or exterior of the Country House inn. The inn, along with the 15th century almshouses, was completely gutted by fire in 1942. The photograph above left shows still-standing walls associated with the canonry after the inn had been destroyed in 1942. Significant remains of both buildings were demolished in the post-war rebuilding. Only the former kitchen survives to any significant height and both the south wall and the north wall of the kitchen contain the remains of huge fireplaces. The south wall fireplace has survived in a recognisable condition top, although it was significantly rebuilt after 1942. The fireplace on the northern wall is just a jagged hole above the fragments of a chimneystack below, propped up in the centre with a modern brick pier. A small blocked-up medieval window is visible to the right. The ruins of the canonry have been designated as a Scheduled Ancient Monument. It was buildings like this, like the Country House inn, which made Exeter such a fascinating place prior to 1942. 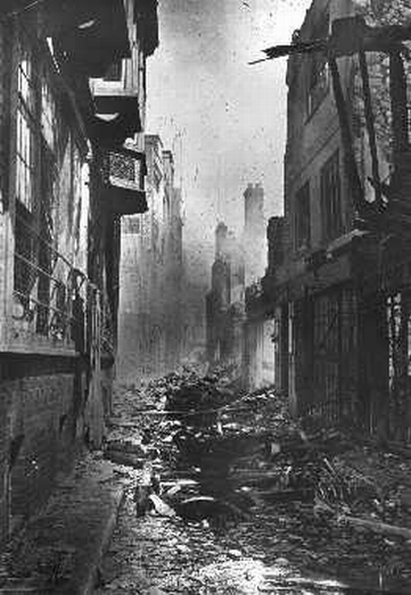 Between the redevelopment of the 19th century and the slum clearances of the early 20th century Exeter had ceased to be a visually medieval city, and even by the mid-19th century the scale of the survivals didn't begin to equal those of much larger continental cities, such as Rouen, Nuremburg or Frankfurt. 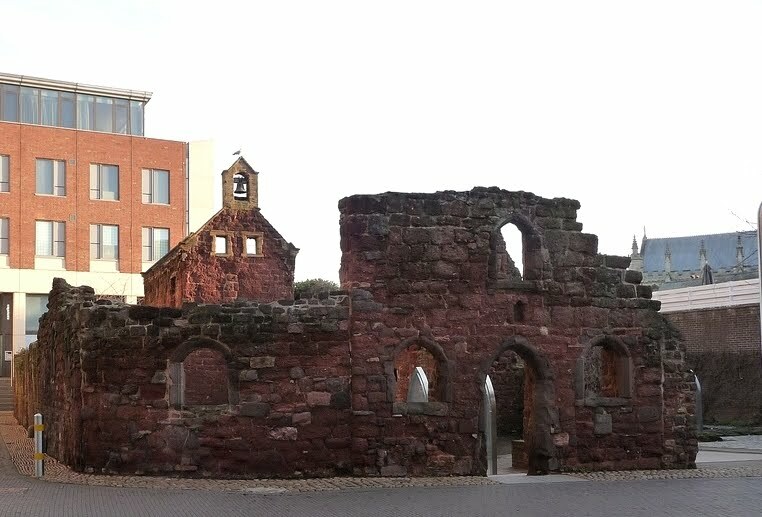 But large areas of Exeter's medieval history were still hidden away behind newer facades. It truly was an architectural palimpsest and it is a tragedy that so much was destroyed before it could be fully understood and recorded for posterity. 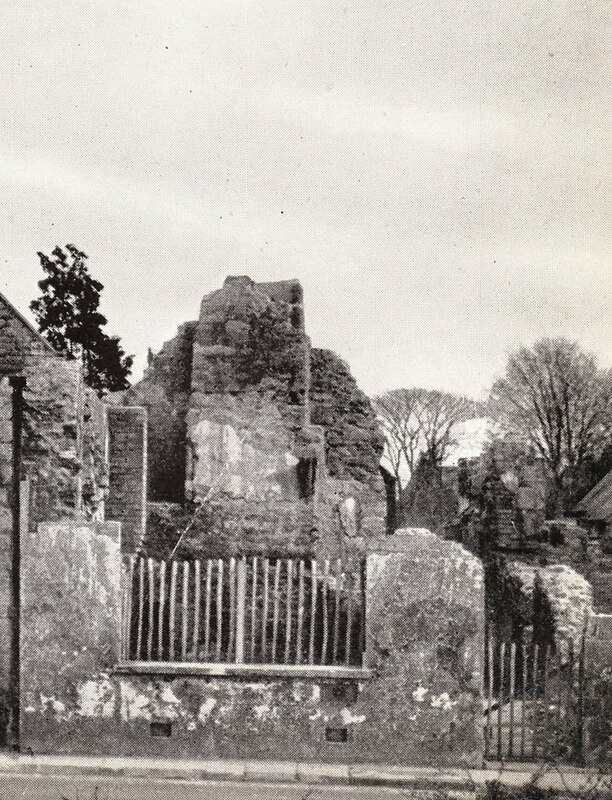 The photograph below shows the ruined 15th century kitchen in the foreground with the remains of St Catherine's chapel behind. Yet another piece of medieval Exeter which went up in flames in 1942. Even with the help of the information plaque attached to a nearby wall, it's difficult to make sense of the mass of ruins which now sit on the corner of Catherine Street and Egypt Lane. The ruins are in fact the remains of two quite distinct and separate medieval complexes: the 15th century almshouses and accompanying chapel dedicated to St Catherine and a canon's house first established in the 1200s. The canonry, a house built for one of the cathedral's many canons, predated the almshouses by over a century and was constructed within the walled boundary of the cathedral precinct. According to Peter Thomas, part of the precinct's 13th century wall remained standing between the canonry and the almshouses until it was demolished during the post-war demolition of the war-damaged ruins in 1959. The history of the canon's house is long and complex as the structure went through numerous transformations until the site was badly bombed in 1942. Something which should be remembered when looking at the ruins today is that the canonry was originally three or four times larger than the area occupied by the almshouses. The image right is based on the 1905 Ordnance Survey map of Exeter combined with an aerial view of the same area today. The location of the almshouses and chapel are highlighted in red. The approximate extent of the canonry in the 13th century is highlighted in purple. As can be seen, the almshouses occupied by far the smaller portion of the site, although the state of the ruins today gives the opposite impression as so little of the canonry has survived (only two large fireplaces, a couple of windows and a fragment of wall). St Catherine's Almshouses below left and top were founded c1450 by Dr John Stevens, a Canon Residentiary of the cathedral. The almshouses were dedicated to St Catherine and were designed originally to house thirteen poor men nominated to reside there by the cathedral's Dean and Chapter. Fortunately the original petition made by Canon Stevens to found the almshouses still survives. In the petition he states that he had bought "a parcel of ground, void at the time of purchase and not built upon, adjoining to the closure of [the] cathedral church". The almshouses and chapel appear to have been constructed in 1458. Writing in 1915, Lega-Weekes described the medieval almshouses as "a picturesque low building of red sandstone, with a bold curve in its walling, instead of a sharp angle, as it turns the corner of Catherine and Chapel Streets, an irregular roof, or group of roofs, a stone arched doorway, and diminutive stone windows, some arched and moulded, some oblong and plain chamfered". 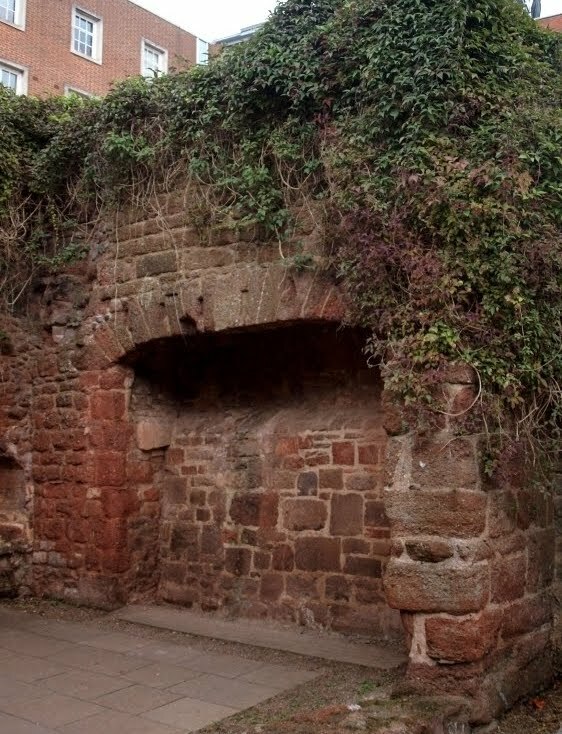 The entire complex was constructed from the local red sandstone known as Heavitree breccia, with dressed blocks of purple volcanic trap used for mouldings around the doors and windows as well as for the fireplaces. Entry into the almshouses was through an arched doorway via Catherine Street. A covered passageway led through into a small courtyard, possibly with external stairs leading to the rooms on the second floor, with a rectangular well built into the north face of the first courtyard. A further passageway led to another small courtyard, with yet more small cells built around the sides, in the centre of which was the oratory, a chapel dedicated St Catherine and constructed as place of worship for the almshouses' residents. The chapel is believed to have been originally divided horizontally, creating two separate rooms, the upper room accessed via an internal staircase. The photograph top shows the side wall of the chapel inset into which are two external doors. One gave access into the ground floor chapel and the other gave access to the staircase leading to the upper floor. 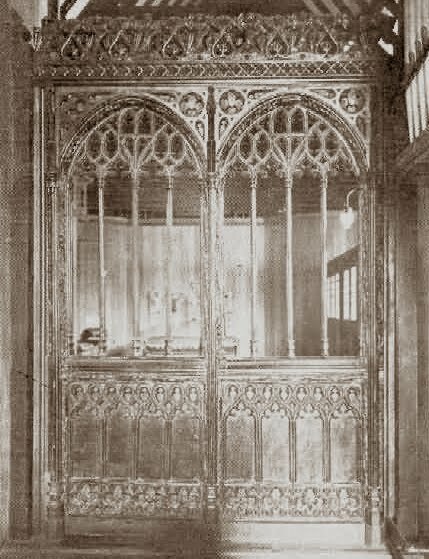 On the ground floor was the altar with an elaborate traceried window at the east end. In the south wall, near the altar, were the remains of a piscina, used for washing the communion vessels. Near the entrance in the exterior wall was a stoup for keeping holy water. The photograph above shows a very rare view of the interior of the chapel c1915. The traceried lower east window is to the right, the arched entrance door visible to the left. The photograph above left shows the remains of one of the surviving mid-15th century fireplaces. In 1806 Jenkins found the chapel 'much desecrated' and used as a carpenter's workshop. It seems to have been used for domestic purposes throughout the 19th century until both the chapel and the almshouses were restored by Lady Hotham in 1894 and given over to the Church Army as a hostel for the destitute. The 'Exeter Flying Post' reported in January 1894 that, during the restoration of the chapel, "many of the architectural features are being brought to light which have long been hidden", including "the interesting old open roof" which was "in a good state of preservation". The report concludes with the confident expectation that "the little chapel will be an addition to the attractions of Exeter, worthy of the highly historic neighbourhood in which it stands." During the Baedeker Raid on Exeter in May 1942 the medieval almshouses and chapel were gutted by fire, leaving only the walls remaining. 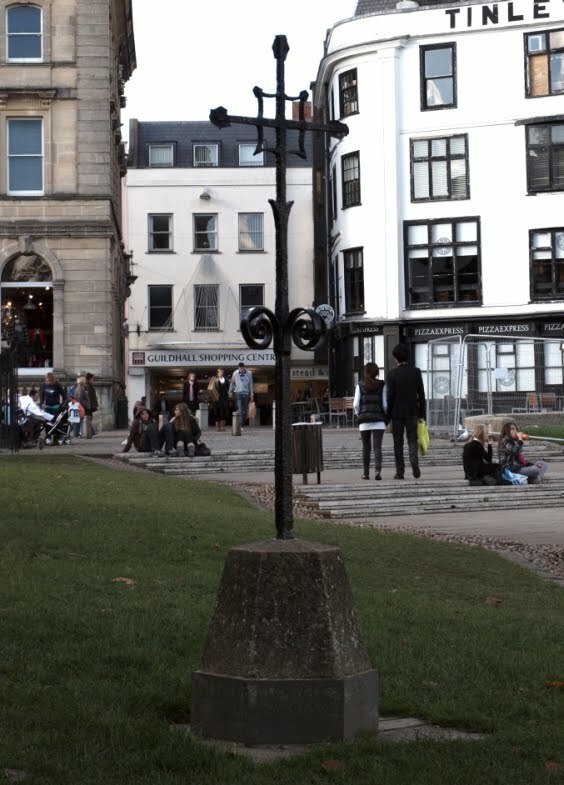 The city council, rigorously following its ideology of refusing to restore or reconstruct Exeter's most important war-damaged buildings, decided to retain the ruins as a memorial to those killed during the bombing raid, although there's no significant mention of the city's casualties anywhere on the site. 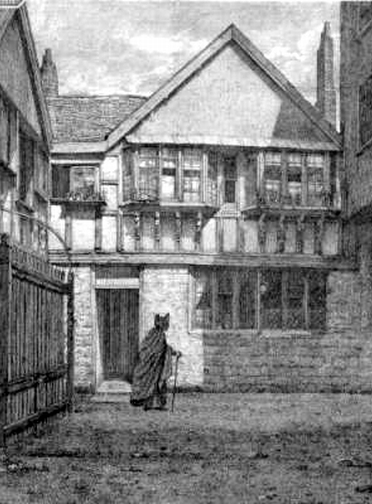 Thomas Sharp in 'Exeter Phoenix', his published report for the reconstruction of Exeter after World War Two, stated that the almshouses and the adjoining Country House Inn (containing parts of the medieval canonry) were less damaged than the Hall of the Vicars Choral in South Street but were "nevertheless so far ruined that restoration would amount to rebuilding - and that would mean that the buildings would lose both their worth and their significance". Sharp advocated leaving the ruins "more or less as they are now". Unfortunately the ruins of the almshouses weren't left more or less as they were then, and far more remained of the ruined buildings in 1942 than is currently visible today. Photographs taken after the war, such as that shown above, prove that the walls of the almshouses survived up to roof height. One wonders why, given the then extensive nature of the remains, the almshouses weren't simply refitted with a roof and floors and put back into use. At least a year after the Blitz, the city council embarked on a process of making the ruins 'safe' and in doing so demolished most of the still-standing structure. Their current appearance above is nothing more than the product of extremely brutal tidying up after 1942. The ruins today are scrappy and incoherent, and not particularly impressive. Complete reconstruction of the almshouse complex was always a possibility but it never seems to have been considered. One interesting consequence of the destruction was the archaeological excavation which took place after the Second World War. It found the remains of a large Roman house with significant fragments of a tessellated pavement dating to the 4th century AD. It was originally the floor of a corridor which connected a range of rooms and perhaps came from a Roman workshop at Dorchester in Dorset where similar examples have been found. 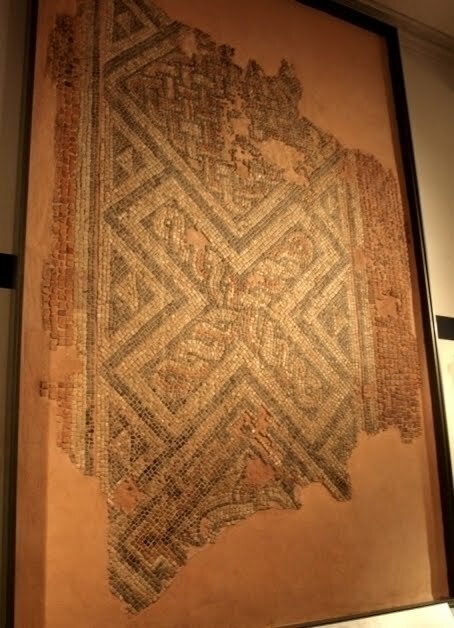 The mosaic below was recovered and it is now on display at the Royal Albert Memorial Museum in Exeter. 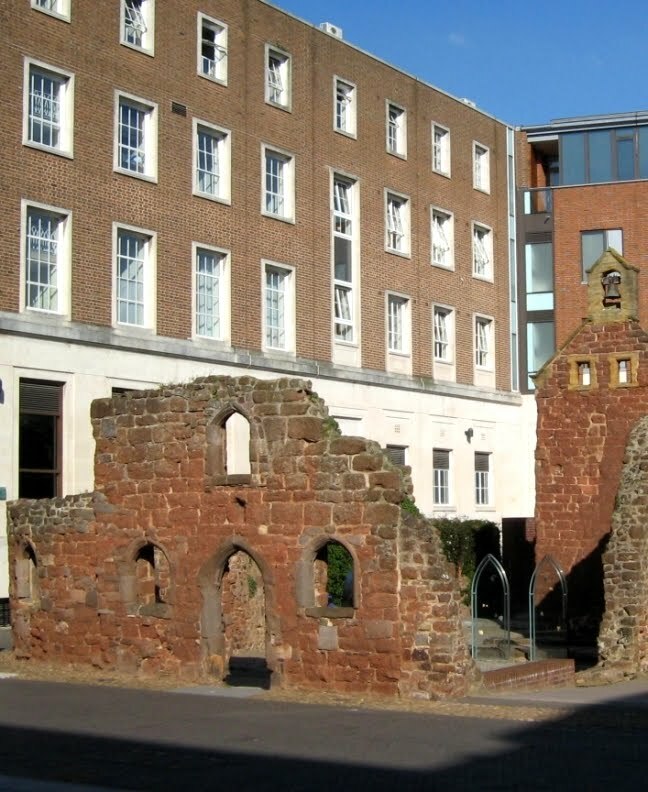 The remains of St Catherine's Almshouses have been designated as a Scheduled Ancient Monument. In the 18th century over 370 coaches left Exeter every week, destined for London, Bath and Bristol. 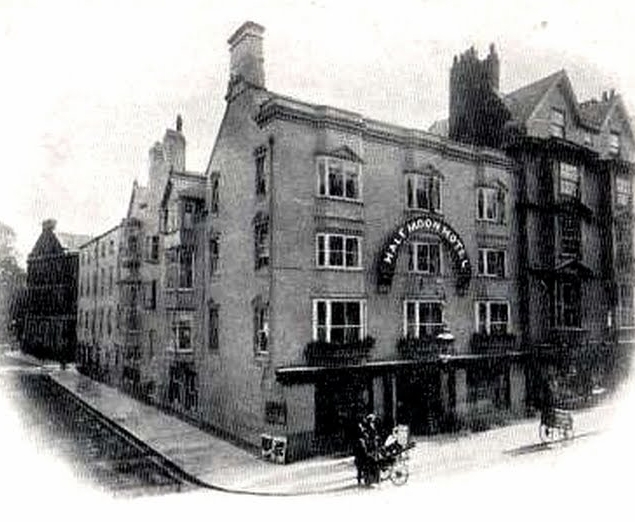 For over two centuries, along with the New London Inn, the London Inn and the Mermaid, the Half Moon left was one of the principal coaching inns in the city. Coaching inns differed from taverns in as much as they supplied teams of horses for stagecoaches and mail coaches and often acted as points of departure in the way that modern railway stations do today. The Half Moon at Exeter stood on the corner of the High Street and Bedford Street and dated from the 1680s, a direct consequence of the increased traffic between Exeter and other large cities across England. At the time of its demolition at least, it was huge; a rambling, sprawling establishment which covered the entire site, extending from its main entrance on the High Street all the way back to Catherine Street. The stables and the coachhouses were all located on the other side of Catherine Street in Egypt Lane, and following the demise of horse and carriage as a means of transport it became a very popular hotel. The image right shows the location and extent of the Half Moon in 1905 overlaid onto a modern aerial view of the same area. The inn is highlighted in red. 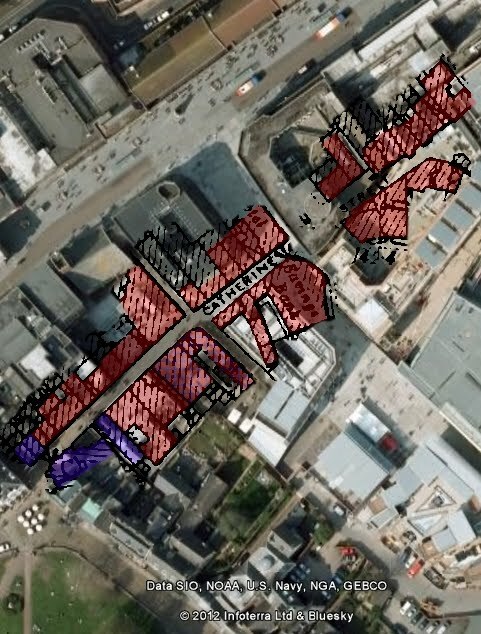 The site of the ancient New Inn is highlighted in purple. St Stephen's church is highlighted in yellow. The building labeled 'Savings Bank' marked the beginning of Bedford Circus and is shown to the far right in the photograph at the top of this post. The area was affected by bombing in World War Two and during the post-war rebuilding Bedford Street was realigned the west. It's easier to write about the people who used the inn than it is to write about the building itself as so little architectural evidence survives. The Half Moon wasn't just a hostelry, it was also frequently used as an auction house and as a place for social gatherings. For example, in 1824 the governors and benefactors of Exeter's hospital "proceeded to the Half Moon Inn" to celebrate the hospital's foundation in 1741 and where "an elegant dinner was provided"; and in 1842 a "grand dinner" took place at the Half Moon with a guest list which included "Magistrates, Members of the Council, Gentry and respectable inhabitants of Exeter". These are two of many dozens of 19th century examples that were deemed worthy of mention in Trewman's 'Exeter Flying Post'. 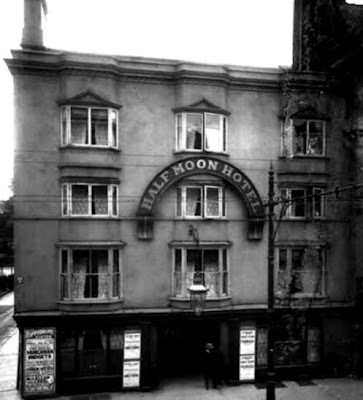 In the 1850s the Half Moon was run by William Routley and later by Robert Pople, later to be thrice mayor of Exeter. In October 1868 Pople moved on to the New London Inn and the licence for the Half Moon was transferred to Thomas Gardner. Gardner, originally from London, had already taken out a lease on the Royal Subscription Rooms and was to remain at the Half Moon until the 1880s. Like both Routley and Pople before him, Thomas Gardner was a Freemason and a member of the city's St John the Baptist Lodge. Masonic dinners at the Half Moon were regular occurrences throughout the 1800s. In 1856 a "Grand Masonic meeting" took place at the inn, for which "the large Masonic room was adorned with laurels and other evergreens". Another report from 1872 recorded that "the brethren adjourned to the Half Moon Hotel, where a sumptuous banquet was served by Brother Gardner". In 1871 Gardner turned one of the rooms into a billiard room. This room was described at the time as being "lofty, the ceiling beautifully and richly moulded, and the sides are most elaborately adorned". This must've been one of the rooms which still contained late-17th century plasterwork decoration. One interesting historical event occurred at the Half Moon in August 1882 when Gilbert and Sullivan met in the coffee room of the Half Moon to discuss the finale of Act One of 'Iolanthe'. Much less is known about the building itself. It was certainly established by the 1680s but it is impossible to say how much of the 17th century structure survived into the 20th century. James Cossins in his 1877 'Reminscences' stated that in 1827 the Half Moon "had a very different appearance". We can only guess as to what the building's original appearance was like before it received its 19th century makeover. As shown in the image above left © Devon County Council, for most of the 19th century the street frontage was three-bays wide and spread over four floors with tiered oriel windows extending from first-floor level to a modillion cornice. The third-floor windows were crowned with triangular pediments. In the centre of the ground floor was an open passageway through which it was possible to access a central courtyard. This stucco facade was only dated to c1830 though. Presumably the late-17th century version was smaller with a gabled, timber-framed facade. I'm not aware of any illustrations showing the exterior of the inn prior to its modernisation. 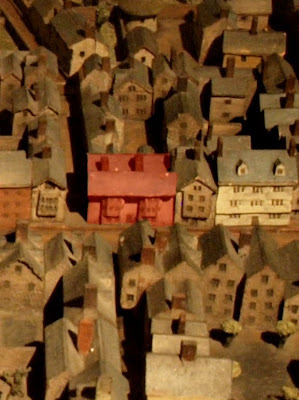 A building on the same site is shown on Caleb Hedgeland's early 19th century model which depicts the city as it appeared in 1769. This building, highlighted in red above right, stands on the corner of Bedford Street and the High Street but it would be unwise to assume that it's an accurate representation in miniature of the Half Moon itself. One notable architectural feature of the Half Moon which has been documented though were several fine late-17th century plasterwork decorative ceilings and these survived up until the building's demolition in 1912. In terms of style they were similar to the great 'Apollo' ceiling at the New Inn, a few properties further down the High Street towards St Stephen's church. Although simpler in design, it's possible that the ceilings at the Half Moon were the work of Thomas Lane, the craftsman responsible for the ceiling at the New Inn in 1689. It's bizarre that Harbottle Reed could write retrospectively in 1931 that the Half Moon "did not appear to have much of interest". The Half Moon inn was demolished in 1912 to make way for Lloyd's bank and the extraordinary neo-Baroque, quasi-Jacobean, Art Nouveau-inspired Deller's Cafe. No record was made of the building as it was being destroyed and so most of its structural history is now lost for ever. The Royal Albert Memorial Museum managed to salvage some of the plasterwork ceilings during the demolition and one of them can still be seen at the museum today above. It's ironic that, if the inn hadn't been demolished and the ceilings salvaged, then they would've been completely destroyed in the bombing of May 1942. During the post-war reconstruction the alignment of Bedford Street was significantly altered and the site of the Half Moon inn, and later Deller's Cafe, is now actually in the middle of Bedford Street itself below. This site of St Mary Major, shown left c1850, must count as one of the most fantastically historical places in the entire city. Before its removal in the 1970s, there had been a church of some form at this exact location for more than 1300 years, over three centuries older than the foundation of the Cathedral itself. The story begins with the fall of the Roman Empire and the Roman withdrawal from the British Isles in the early 5th century. 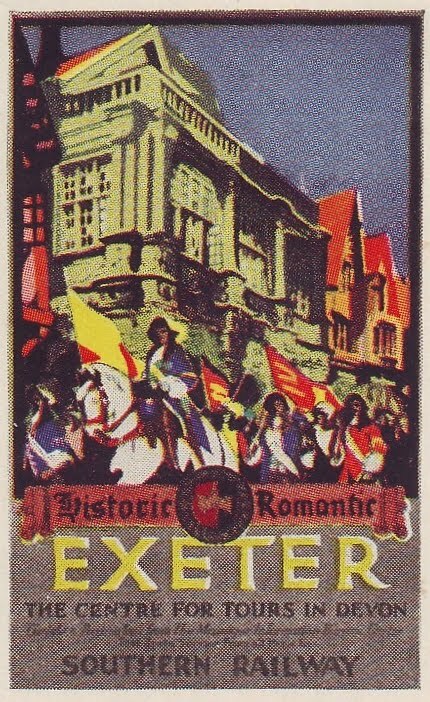 Very little is known about the immediate post-Roman period in Exeter, once a major Romano-British city. Given the city's strategic location, and the fact that it was walled around with massive Roman stone defences, it seems likely that a small community of Romano-British and Celts remained living at Exeter even after the Roman political and social infrastructure collapsed. It's easy to imagine people living amidst the crumbling city walls of Exeter, establishing their own way of life as the great Roman public buildings slowly collapsed around them and the weeds and the grass reclaimed the stone-paved streets and mosaic floors. Bits of the these old Roman buildings have sometimes turned up in later Anglo-Saxon structures e.g. part of the wall of the Anglo-Saxon church of St George in South Street. 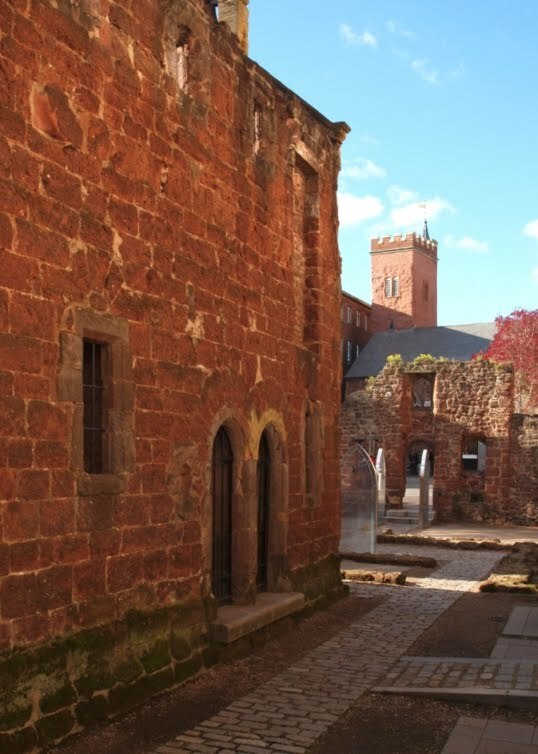 What is certain is that sometime in the 7th century, after the Saxons had arrived in Devon and settled at Exeter, an early Christian monastery was founded in the city. There are very persuasive historical and archaeological reasons for believing that the monastery's minster stood on the site of what would later become the parish church of St Mary Major. It was at this monastery that St Boniface, the patron saint of Germany and the first archbishop of Mainz, was educated c680 AD. The monastery was refounded in c930 AD by the Anglo-Saxon King Athelstan. The monastery buildings were rebuilt in 1018 by King Canute after they were destroyed by the Danish king, Sweyn Forkbeard, during an exceptionally destructive raid in 1003. 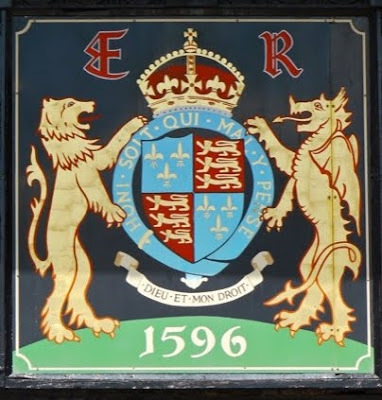 And then something extraordinary happened to Exeter just five decades later in 1050: Edward the Confessor granted a request from Bishop Leofric above right to move the episcopal seat from Crediton to the larger, more secure settlement of Exeter. In one stroke Exeter became a cathedral city. 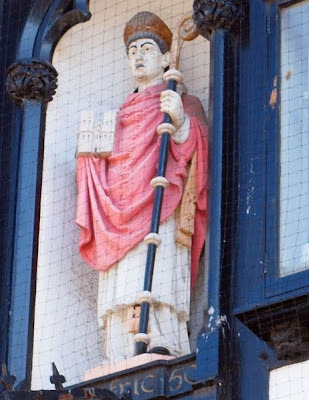 Leofric was enthroned as the first Bishop of Exeter in the Saxon minster of St Mary and St Peter in the presence of Edward the Confessor himself. The minster building became Exeter's first cathedral, a status it held through the Norman Conquest of 1066 until the construction of a new Romanesque cathedral began in 1112 on a site slightly east of the minster. Archaeological excavations in the 1970s uncovered the remains of a large Saxon building on the same alignment as St Mary Major near the West front of the present-day cathedral. Pre-Saxon burials discovered during the excavations indicated that there was a cemetery, and possibly a church, here even before the 7th century. 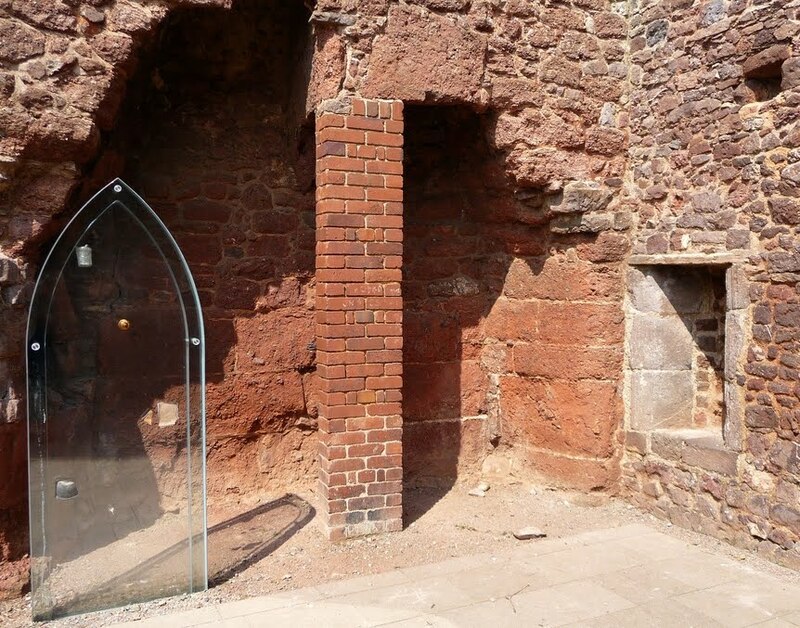 If true it would make the site of St Mary Major the oldest Christian site in Exeter. Even more remarkable is the fact that the Saxon minster was constructed on top of a 2nd century Roman basilica, which was itself constructed on top of a Roman legionary bath house which was built a thousand years before the present cathedral was even started. With the completion of the new cathedral in c1220 the ancient minster was reduced both in size and status and became known simply as the parish church of St Mary Major. And that is how it remained for another 800 years. The church, despite being downgraded from its cathedral status in the 12th century, had one of the largest medieval parishes in Exeter. Only the parish of St Sidwell to the east of the city and lying outside the city walls was larger. The image left is based on the medieval parish boundary of St Mary Major and combines a modern aerial view of the area with a street plan from 1905. It shows just what a large part of Exeter's city centre was covered by the parish. The boundary extended from the church in the north, across South Street and down to the city wall at West Street, encompassing nearly all of the ancient West Quarter. The West Quarter was once the home to many of Exeter's richest medieval and Tudor citizens and a large number of their properties survived until they were demolished for slum clearances in the early 20th century. 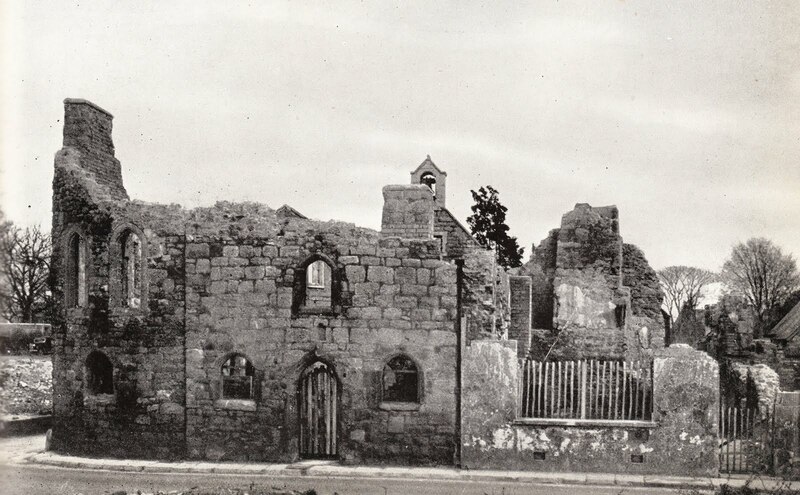 In fact most of the buildings which existed in the parish in 1900 have since been destroyed. The highlighted sites on the image show only those properties which fell within the parish boundary of St Mary Major. The buildings highlighted in purple are the only ones that still survive which pre-date 1905. The sites highlighted in red show areas that have been demolished since 1905. 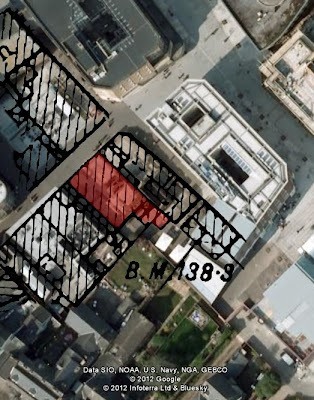 Bomb damage during the Exeter Blitz of 1942 destroyed the highlighted areas in South Street, Sun Street and Guinea Street but the most of the other destruction took place as a consequence of slum clearances, post-war redevelopment and the construction of the inner bypass in the 1960s and 1970s. The image right is a detail from Hedgeland's great wooden model of Exeter showing the city as it appeared in 1769. St Mary Major is highlighted in red. The west front of the cathedral is to the left. Also visible is the turreted Broad Gate, the ceremonial entrance into the cathedral precinct from the High Street. The church had several names, including St Mary Moor and St Mary Michel, the latter derived perhaps from the Saxon word 'mickle' meaning 'great'; but it was generally known as St Mary Major, either a reflection on the size of its parish or a comment on what was a large medieval building. The name also helped to distinguish the church from St Mary Steps and St Mary Arches. The church had clearly been added to and altered over the centuries, but its most distinctive feature was its enormous western tower, described by Jenkins in 1806 as a "singular construction" which had the appearance of a "keep of an ancient castle". Yet another name the church went by was St Mary of the Tower. Jenkins, along with others, seems to think that this tower was part of the Saxon minster. The rounded staircases on the exterior of the tower walls were a feature of Saxon church towers. If the tower wasn't pre-Conquest then it dated from soon afterwards, and was almost certainly built before the new cathedral was begun c1114. Jenkins reported that internally the church consisted only of a nave, without side aisles or supporting columns. The nave seems to have dated from the reign of Edward III as Bishop Grandisson rededicated the high altar in 1336. According to Jenkins the chancel at the East end was accessed via a "lofty Gothic arch", the chancel being "of a more ancient date than the body of the church". The chancel was also accessible from outside through an entrance in the north wall. 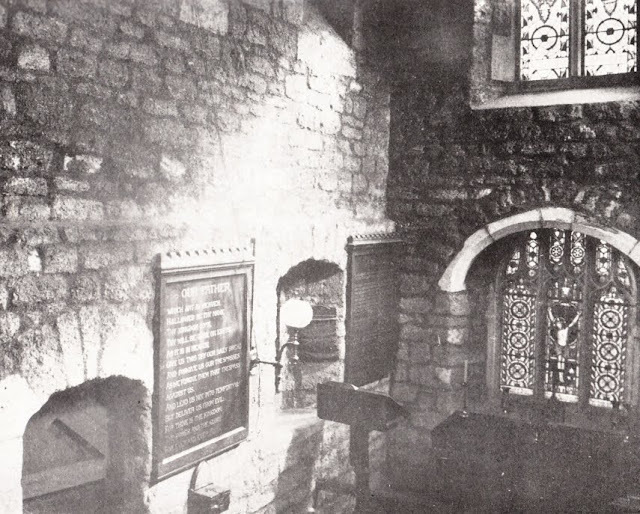 (A rare photograph of the medieval chancel can be seen here.) Until the middle of the 19th century the south and west walls of the church were almost completely obscured by the College of the Vicars Choral at Kalendarhay. In 1768 a survey was undertaken that showed the tower in a state of some dilapidation, "in danger of falling" and "greatly overhanging the base". To remedy this potentially disastrous development, 35ft of the upper courses were removed and a cupola built to hold the bell. The unusual image above left is from Rocque's 1744 map of Exeter and shows the full height of the tower prior to its reduction. The tower was originally topped by a spire and a weather vane, both of which had to be repaired in 1567 following a violent storm. This weather vane caused all sorts of problems for a famous Royal visitor to the city. In October 1501 the Spanish princess Catherine of Aragon, the first but not the last of the wives of Henry VIII, spent the night in the nearby Deanery on her way from Plymouth to meet her first husband, Henry's brother, Prince Arthur. The weather was foul and a great storm raged over the city, and as the wind blew the weather vane whistled and squealed as it spun upon the spire of St Mary Major. Unable to sleep, the future Queen ordered the weather vane to be removed and a servant was sent up the steeple in the middle of the storm to take it down. It was replaced after she'd left but apparently the spire met its end in 1580 when yet another storm sent it crashing to the ground. By the mid-19th century the church was in need of repair. The exterior stone walls, covered with plaster, needed frequent coats of whitewash and much work was required on the roof. In 1865 it was decided to demolish the church completely and replace it with a new one. To quote Beatrix Cresswell, "the complete rebuilding of this church in 1865-1867 [was] one of the many regrettable well-intentioned mistakes from which our parish churches suffered during the last century under the name of 'improvement', a word which covers a multitude of sins." Almost everything was demolished, the 900-year-old tower, the chancel, the windows, the spiral staircases, the windows, the roof, the floor. 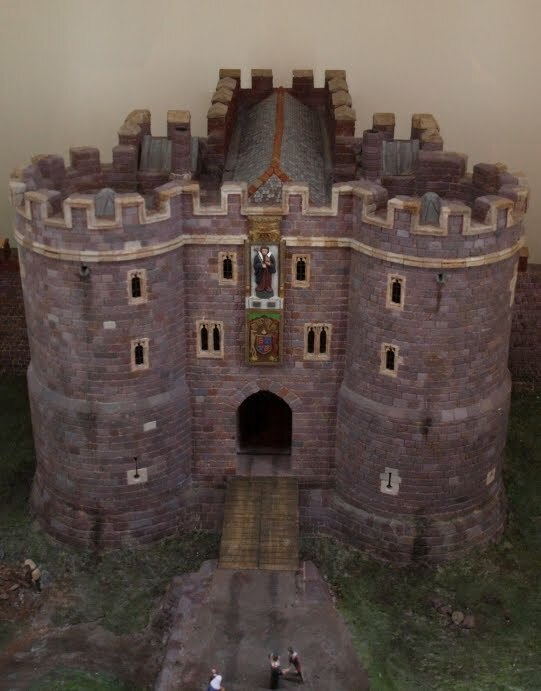 It was one of the most important historic buildings in Exeter's 2000 year history and it was swept away without any regard to its great antiquity at all. The foundation stone of the new building was laid on Monday 05 March 1866. The new church was situated slightly further west than its medieval predecessor so as to improve the view of the Cathedral. As far as I know only two pieces of decoration survive from the medieval church: a small piece of carved stone representing the martyrdom of St Lawrence upon a gridiron which had been in the set into the outer wall near the east porch and part of the exceptionally fine medieval rood screen, part of which was removed to St Mary Steps and part of which remained in the rebuilt church of St Mary Major above right. Everything else was destroyed. The Victorian replacement above left never seems to have been popular and was regarded as worthy but dull almost from the moment it was built. Someone said that the replacement church was only 'Major' as an architectural disaster. At the laying of the foundation stone in 1865 the mayor announced that the new church would be "a permanent ornament to the city". In fact it barely lasted a century. In 1971 it was itself demolished and the 1400-year history of St Mary Major came to a close. 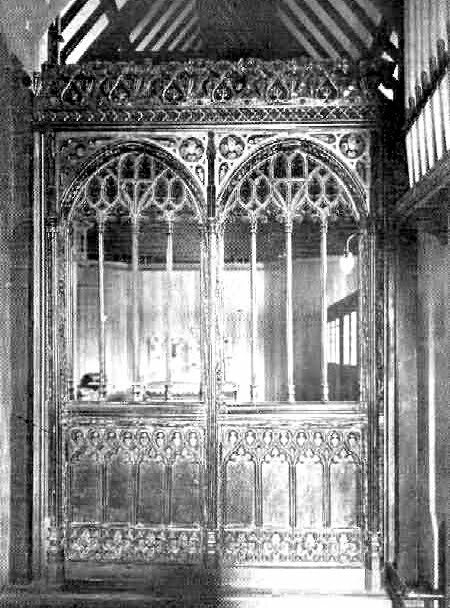 (The remaining two bays of the medieval screen were relocated to the parish church at Offwell.) Today the only sign that there was ever a church on the site is the cross that once sat upon the steeple of the Victorian replacement, set into a grassy area in the Cathedral Yard below. The late-19th century statue of Leofric, holding a model of the Romanesque cathedral in his right hand, sits high up on the facade of No. 53 High Street. Dix's Field: "Only Ruin, not Annihilation"